There’s always something from businesses to get your attention but most of the time they get discarded. If you’re a small business and looking for promotional items that won’t get thrown away, how about Safety Magnets? Safety Magnets still showcase your business logo and information but also share information on what to do in an emergency situation such as how to give CPR or the Heimlich maneuver. Right now they even have a Safety Magnets Offer where when you order 100 you get 50 free! There are also tons of other items for your business through the Safety Magnets store. 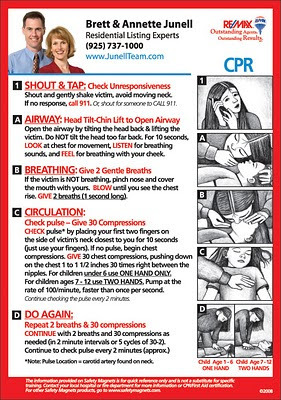 You can get items such as memo boards, items in Spanish and even dog CPR. The possibilities are endless. Since February is American Heart Month, why not use this opportunity to promote your business while at the same time giving out useful information to your clients and potential clients? There’s heart attack and stroke warning signs for example. With the peel and stick business card magnets your consumer can stick them anyway for later use. So while your customer has the useful information stuck to their refrigerator, it showcases your business as well. Now that’s a useful combination. Check them out and see what all they have to offer and don't forget to look at the customer testimonials.